The shoulder is by some margin the body’s most mobile joint. This ability also unfortunately makes the shoulder inherently unstable and it therefore accounts for roughly 50% of hospital admissions for dislocations or subluxations (partial dislocation). To achieve this dynamic range of movement the ball (or head) of the upper arm bone (the humerus) fits into a shallow socket (the glenoid). The ball of the shoulder is huge when compared to the shoulder socket, with only about 30% of it in contact with the socket at any one time. 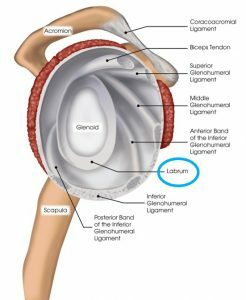 To increase the depth of the socket there is a ring of cartilage called the labrum that encircles the joint and enlarges contact area by an extra 20%. A good simile would be a golf ball that sits on a small tee! 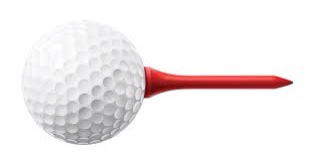 Both tendons and ligaments are important in strapping the golf ball on the tee, centralizing it and keeping it secure! 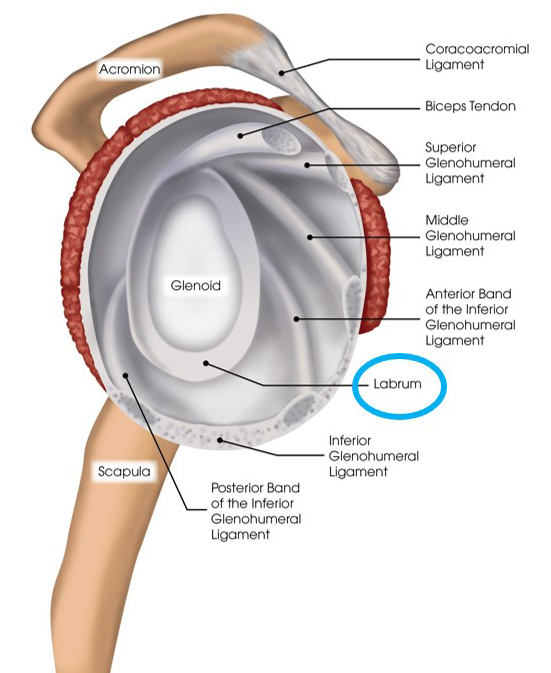 A strong robust system of ligaments coalesces to form a shoulder capsule, this ligamentous system is illustrated below. If this system fails, the shoulder will become unstable and this occurs usually for two reasons. Because of trauma and/or instability. Traumatic dislocations are most common. 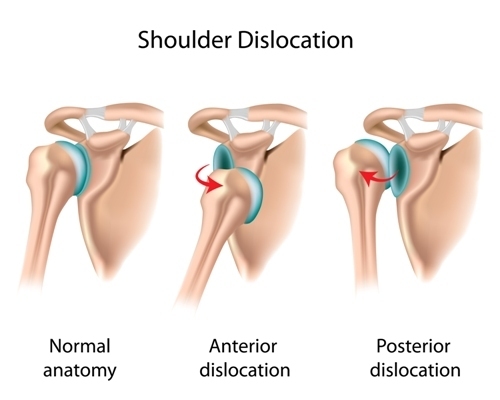 The shoulder tends to dislocate forwards and down in 96% of cases (this is known as an anterior dislocation and is illustrated below). This is usually associated with a sports related injury in young people or falling with an outstretched arm for older people. 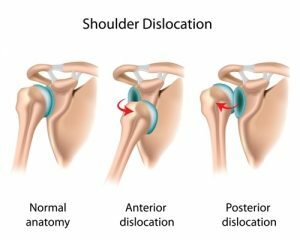 Other types of dislocations which are rare are is when the shoulder is displayed backwards (4%) or downwards (one in 200 cases). Some people are also inherently more mobile than others. This occurs for various different reasons. Some of us are just naturally hypermobile. In fact, there is a scoring system based on hypermobility called Beightons Hypermobility Index that uses a 9 point index for joint laxity with 6 points or more being an indicator of hypermobility. In such cases we often see multidirectional instability with the head of the humerus being unstable in all directions and this is obviously allied with a capacity to dislocate. These people are often what we term as ‘double jointed’. Other people can also have joint laxity because of repetitive overhead movements that are typical in many sports such as cricket, swimming and tennis or in jobs which require regular and repetitive overhead motions. 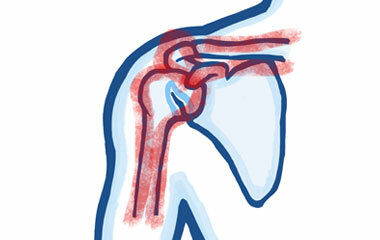 Once the ligaments, tendons, and muscles around the shoulder become loose or torn, dislocations can occur repeatedly. Chronic shoulder instability is the persistent inability of these tissues to keep the arm centred in the shoulder socket. 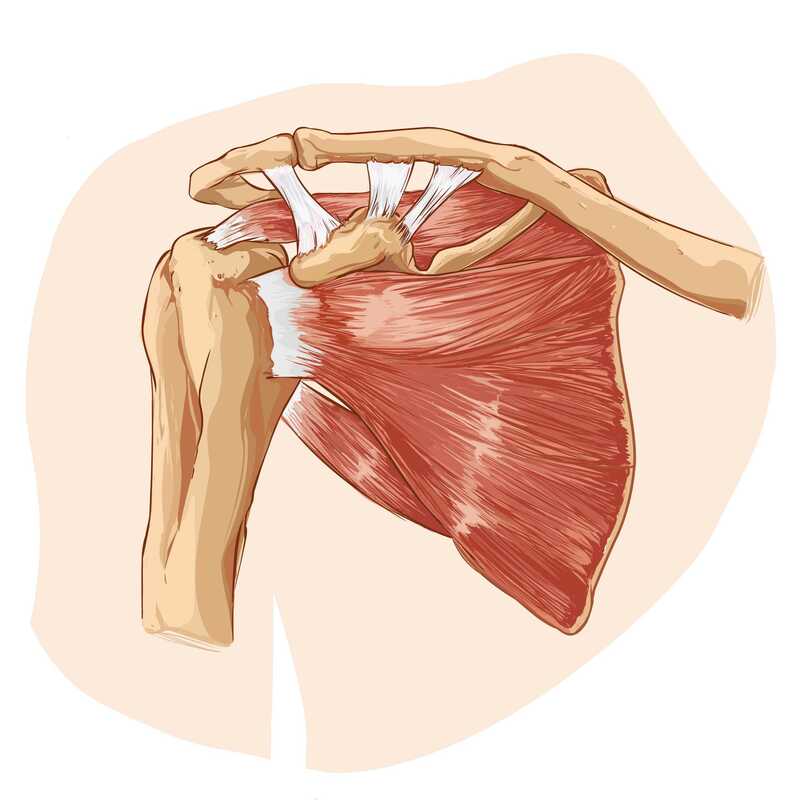 This model is quite simplistic, and surgeons now often use the Stanmore Triangle which classifies a third group of patients that have reccurent dislocations because of loss of shoulder integrity. We mentioned earlier that to increase the depth of the shoulder socket there is a ring of cartilage called the labrum that encircles the joint and enlarges contact area by an extra 20%. 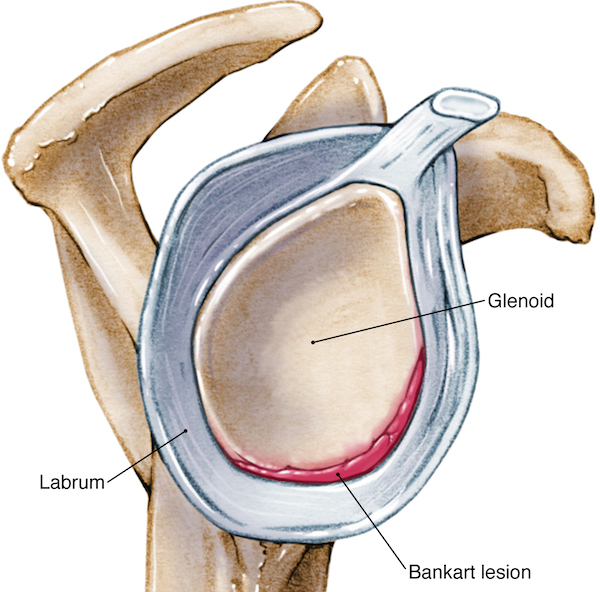 When dislocations occur this causes damage to the labrum and are termed Bankart lesions. These lesions result from detachment of the labrum from the underlying shoulder socket as a direct result of the dislocated humeral head compressing heavily against the labrum. 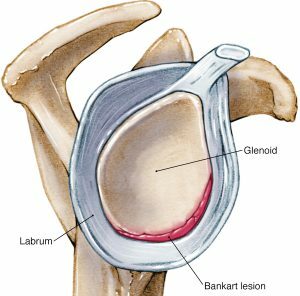 Dislocation can cause damage specifically just to the labrum only (“soft Bankart”) or involve the bony socket as (or glenoid) margin (impaction fracture) and this is called a “bony Bankart”. Soft Bankart lesions are more common than bony Bankart lesions. These lesions often occur with Bankart lesions. A Hill-Sachs lesion is basically a dent in the back of the head of the upper arm bone (or humeral head). 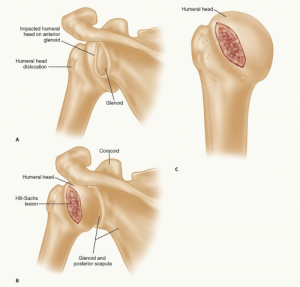 This occurs during the dislocation as the humeral head impacts against the front of the shoulder socket (glenoid). The depth of the lesion reflects the amount of damage to the joint. Therefore, larger Hill-Sachs lesions are associated with higher risks of recurrent dislocations. Your acromioclavicular joint (or AC Joint) is the joint at the top of your shoulder between your collarbone and a hook of bone (the acromium) that curls around from the shoulder blade. The AC joint is important as it allows overhead and across the body movements of your arm, as well as transmitting forces from the arm to the rest of the body during activities such as pushing, pulling and lifting. There are a number of ligaments which help to stabilise this joint as seen below. These ligament injuries are often injured in contact sports or falling with an outstretched arm. Acromioclavicular joint injuries are classified most commonly using the 6-type system described by Rockwood (1998). Grade I – A slight displacement of the joint. The acromioclavicular ligament may be stretched or partially torn. This is the most common type of injury to the AC joint. Grade II – A partial dislocation of the joint in which there may be some displacement that may not be obvious during a physical examination. 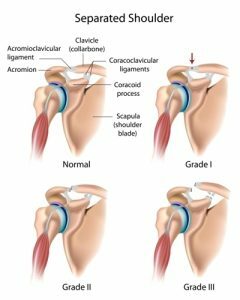 The acromioclavicular ligament is completely torn, while the coracoclavicular ligaments remain intact. Grade III – A partial dislocation of the joint in which there may be some displacement that may not be obvious during a physical examination. The acromioclavicular ligament is completely torn, while the coracoclavicular ligaments remain intact. Please note: Under current legislation issued by the Advertising Standards Agency we cannot state that we treat a condition unless there is robust scientific evidence to support any given claim.